The BCW Direct Retail label is a coated direct thermal paper facestock with highlight printing to emphasize either the product description or pricing scheme. Our labels offer high print quality and abrasion resistance for indoor industrial applications up to 6 inches per second. The permanent acrylic adhesive covers a wide range of materials including corrugated, paper, metals and plastics. 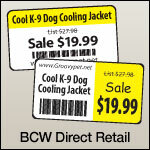 The BCW Direct Retail label is recommended for applications that do not require durability against water, heat, and humidity. No ribbon required. 2.00" x 1.00" direct thermal paper label with a 5/16" color stripe along the top edge of the label on a 1" x 4" core. 1500 labels per roll / 8 rolls per case. Special features - Perforated. No ribbon required. 2.00" x 1.00" direct thermal paper label with a 7/8" color box along the right edge of the label on a 1" x 4" core. 1500 labels per roll / 8 rolls per case. Special features - Perforated. No ribbon required. 2.25" x 1.25" direct thermal paper label with a 3/8" color stripe along the top edge of the label on a 1" x 4" core. 1275 labels per roll / 8 rolls per case. Special features - Perforated. No ribbon required. 2.25" x 1.25" direct thermal paper label with a 1" color box along the right edge of the label on a 1" x 4" core. 1275 labels per roll / 8 rolls per case. Special features - Perforated. No ribbon required.